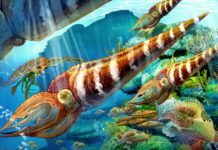 The Mesozoic Era began approximately 252 million years ago and ended about 66 million years ago – or about 186 million years ago. This is a period of time many paleontologists call the “Age of the Reptiles” but it’s also known as the “Age of the Conifers.” Which isn’t surprising since both reptiles and conifers thrived during this time in Earth’s history. The name of this era literally means “Middle Life,” an apt description since it came between the Paleozoic (which means “Ancient Life”) and the Cenozoic (which means “New Life”). This era is most likely on of the most well-known eras to amateur paleontologist because it is subdivided into three periods. These periods are the Triassic Period, The Jurassic Period and the Cretaceous Period. Beginning about 252 million years and lasting approximately 51 million years, until about 201 million years ago, was the Triassic Period. 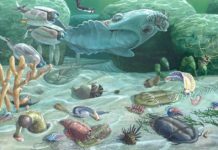 This period began right after the Third Major Extinction that came at the end of the Permian Period and lasted until the Triassic-Jurassic Extinction Event that would come at the end of this period. Which is extraordinary because life had such a small sliver of time to rebound from one major extinction event to the next but managed to do so very well. This period is also subdivided into three epochs. These three epochs are the Early Triassic, the Middle Triassic and of course, the Late Triassic. During the Early Triassic Epoch, the supercontinent Pangaea was the major land mass and it was a dry desert that had little water. It was populated by all of the vertebrate life that had managed to survive the Great Dying. This included animals such as Euparkeria, Labyrinthodonts, and Lystrosaurus. It was also during this time that primitive amphibians known as tetrapods began to evolve. These creatures, which included animals such as Temnospondyls would go on to become the great predators of this time period. The Middle Triassic Epoch would see the supercontinent Pangaea begin to break apart and open up the Tethys Sea. It was also a period of time when all of the organisms of the planet had begun to fully recover from the last extinction event. During this time, mosquitoes and fruit flies became plentiful, and algae, coral, and sponges had fully recovered. It was also the time when the reptiles began to grow to ever larger sizes and when the first crocodiles began to emerge. The Late Triassic Epoch saw the planet begin to warm. As a result, reptiles began to evolve and the first dinosaurs appeared. 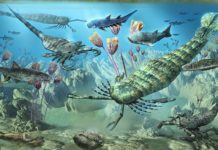 However, as climate change marched on, it would eventually lead to the Triassic-Jurassic Extinction Event which killed a third of the marine life on the planet and the majority of the large amphibians. The second period of the Mesozoic Era is the Jurassic Period. The Jurassic Period began about 200 million years ago and ended about 145 million years ago. 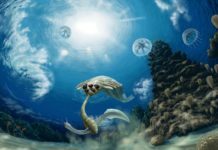 This period would begin right after the Triassic-Jurassic Extinction Event and saw a planet that would become even more tropical than it had been before. This period is broken down by paleontologists into three epochs. These epochs are the Early Jurassic Epoch, the Middle Jurassic Epoch, and the Late Jurassic Epoch. The Early Jurassic Epoch saw the continued evolution of the first true crocodiles and the rise of the archosaurs. It was also a time when the first mammals began to evolve, although they remained small for all of the Jurassic Period. The Middle Jurassic Epoch saw the rise of sauropods and theropods. Much of the world’s forest were populated with conifers. This epoch is considered the pinnacle for reptiles. The Late Jurassic Epoch saw the evolution of the first avians and an increase in sea levels. This was also a period of time when the number of dinosaurs became especially diverse. The third period and the last one of the Mesozoic Era was the Cretaceous Period. This period is known as the longest one of the era as well, running approximately 80 million years. During this period of Earth history, a variety of dinosaurs began to evolve and mammals continued to expand into ever increasing ecologically niches. 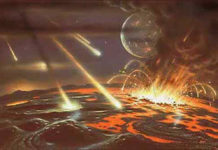 However, it was also a time when the Fifth Major Extinction occurred, also known as the K-T Extinction Event. This period is broken down into two epochs: The Early Cretaceous Epoch and the Late Cretaceous Epoch. The Early Cretaceous Epoch saw the oceans rise significantly – which lead to the expansion of seaways. As a direct result, sauropods went extinct all over the globe, except for South America. It was also during this period that Iguanodon became an evolutionary success and managed to spread to every continent of the world. During this time, the Earth began to experience seasons and the poles got cold every winter. Mammals continued to rise and fill ecological niches abandoned by other organisms. The Late Cretaceous Epoch was the final act of the Cretaceous Period, as well as the Mesozoic Era. During this time, the Earth began to cool and would continue to do so well into the Cenozoic Era. This bound the tropics to the equator and caused wild weather fluctuations in areas above and below the equator. Dinosaurs such as Ankylosaurus, Triceratops, and Tyrannosaurus did very well and soon climbed to the top of the food chain. It seemed like the dinosaurs would continue to dominate for millions of years. However, that didn’t happen because of the K-T Extinction which not only wiped out the dinosaurs but also about three-quarters of all life on Earth. This led to the end of the dinosaur’s reign and allowed mammals to come to power. The Mesozoic Era was an era that saw the supercontinent Pangaea break apart, saw the rise and fall of the dinosaurs, as well as startling climate changes. 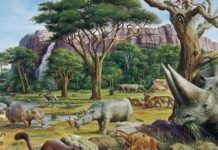 This all set the table for the Cenozoic Era – an era which would become known as the “Age of the Mammals.” Mammals who were more than happy to occupy some of the ecological niches left by the K-T Extinction.